The Best Slow Cooker Mashed Potatoes: Velvety, creamy, rich crock pot mashed potatoes are seasoned with garlic and Parmesan and made easily in the slow cooker. I love mashed potatoes for their creamy texture and the fact that they are a side dish my entire family devours. Velvety mashed potatoes always are a must for my family’s holiday get togethers. They compliment Turkey, Ham, Chicken, or Beef Roast perfectly. But my perfect mashed potato recipe can be a pain to make on the holidays. You know the drill, everyone is rushing this way and that and trying to get dishes out of the oven, the meat carved, the rolls toasted AND draining and mashing up the potatoes. Think about having mashed potatoes warm and waiting for you in the crock pot. Life-Saver! Making mashed potatoes in your slow cooker is an incredibly easy, hands-off approach to making potatoes. Mashed potatoes are flavored with Parmesan and garlic and then cooked to perfection right in the crock pot. Peel and dice up russet potatoes. Add potatoes to the slow cooker with some vegetable or chicken stock and butter and let cook on high until the potatoes are nice and soft. Use a potato masher (or hand-held mixer) to mash the potatoes to a smooth consistency. Add in milk/cream and Parmesan and stir together. Set to warm and your potatoes are waiting ready for your holiday spread! You can keep these crock pot potatoes as basic as you prefer and choose to leave out Parmesan and Garlic. These slow cooker mashed potatoes are also great with the addition of cheddar cheese, bacon and chives at the end of cooking. Crock-pot mashed potatoes can be kept on low in your slow cooker for hours before serving. You can use red-skinned potatoes if you would prefer over russet potatoes, but your mashed potatoes will not be as creamy. I really recommend mashing potatoes by hand or using a ricer for creamy, not gluey mashed potatoes. A hand-held mixer can be used, but be very careful to NOT over mix. Potatoes are simmered with seasonings, milk, and butter in the crock pot and then mashed to perfection with the addition of Parmesan. Place potatoes and garlic in slow cooker. Add in stock, salt, and butter. Cook on high for 3-4 hours, or until potatoes are fork tender, and mash easily. No not drain stock. With a potato masher or hand mixer, mash the potatoes until they are broken down. Add in the milk and cheese and stir until the potatoes absorb. Serve immediately or keep on warm until ready to serve. These potatoes look perfect! Love the parmesan garlic flavors! Parmesan and garlic just make everything taste better! These potatoes look so delicious! So easy to make in the slow cooker which helps free up space on the stove. Gotta love that too! Oh my goodness, these look so creamy and delicious! What a useful innovation. I have quite an ambitious menu this year, so this technique would be such a help! Katie, these certainly will let you focus on the other more complicated dishes! 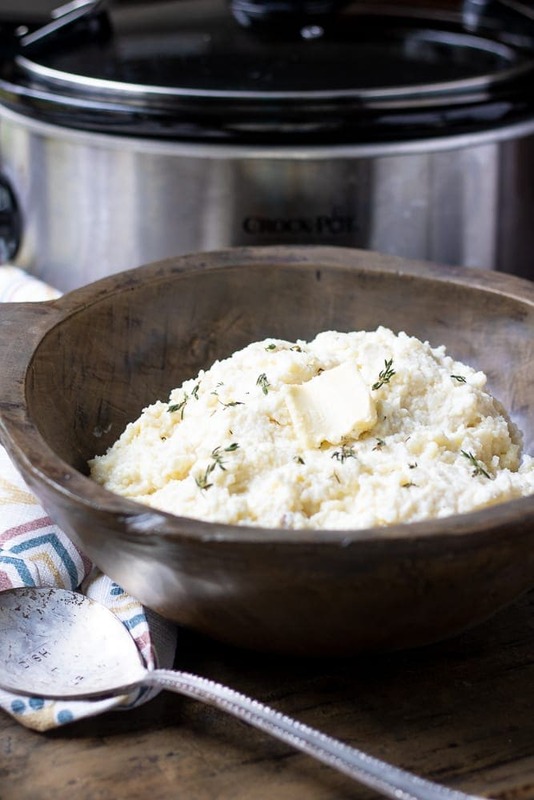 How BRILLIANT are these mashed potatoes in a slow cooker!!! And with fresh garlic and parmesan to boot! Nothing but love for these! I am SO doing this for the holidays. I also toss at garlic clove in with the potatoes as they cook because it adds so much flavor. My extended family are fiends for mashed potatoes. I know that they’ll love the parmesan in this recipe! I bet they will Kirsten! Is there anything better than creamy, delicious, mashed potatoes?? I think not. I would be completely happy diving into a bowl full of these right now! Love how easy they are to make too. Nothing is better than a creamy bowl of potatoes is right! Using 2 cups of chicken stock do you drain after potatoes are cooked just like you do when you cook them on the stovetop? Just didnt see it in your recipe and wanted to be sure I had it down before I tried it! Thanks! Hey Kim, NO you leave the chicken stock in with the potatoes and mash up, adding cream if needed. I will be sure that is clear. These are so great when entertaining! Thanks! These were so good and SO easy to make! YAY!!! I am so happy to hear that Jillian!